Benefit Show: Bernie Sanders Fundraiser // Flint, MI Water Solution (Hamtramck, MI) – Ouch That Hertz! Detroit, MI-based music community organization Elijah’s will be hosting a Bernie Sanders/Flint, MI Water Solution split-benefit fundraiser on Friday, February 12th at the Q Nail in Hamtramck, MI (address below). Flint needs money for forseeable clean water, Bernie needs money to crush the corporate chokehold! The event will feature Detroit locals Too Weird, Travis Albright, Lyra Vega, Broadacre, MOVER SHAKER w/ Craig Adams, Pines, Woodman, and Cosmic Light Shapes. Tickets are only $5 and all proceeds go to benefit Bernie Sanders and the victims of Flint, MI’s toxic water. For those of you unaware of the ongoing issues regarding Flint, MI’s water supple, the Flint Water crisis is a drinking water contamination crisis that started in April, 2014. After Michigan officials decided to change the water source (for the sake of “saving money”) in Flint from treated Detroit Water and Sewerage Department water (sourced from Lake Huron and the Detroit River) to the Flint River (a river notorious for its filth), its drinking water had a series of problems- primarily, it’s extreme lead contamination- which, in turn, created a serious public health danger. 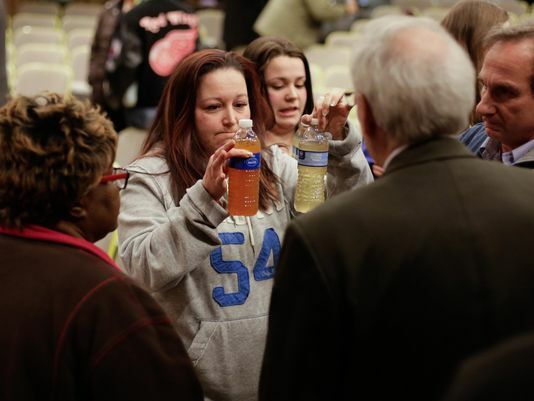 The corrosive Flint River water- which was left untreated (in direct violation of federal law) despite its known corrosiveness– caused lead from from aged pipes to leach into the water supply, thereby poisoning the city and leaving between 6,000 and 12,000 children irreparably damaged by the high levels of lead in their blood.